End of Year Reflection: Dear Next Year’s Class. Provide your students with the opportunity to reflect upon how they have grown through the year. 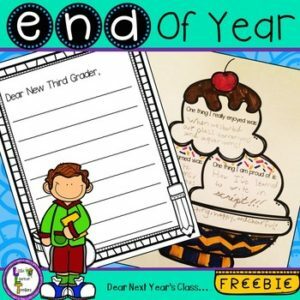 Encourage your students to reflect upon their year and personal successes and highlights, with this fun project! By writing letters for the incoming class (or creating a reference booklet by stapling all of their letters together) students take time to really think about the year. It’s a great opportunity to encourage conversation and reflection and next year’s class will love it too!